The Recipe is one of the most intriguing of the up-and-coming groups on the jam band circuit. While the band's musical style is not necessarily original, the way that its musicians pull everything together is, and what the group offers is a refreshing change from the myriad of Phish derivatives that seem to have taken over the planet. 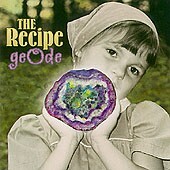 On The Recipe's latest release Geode, the group more often than not sounds like Jefferson Airplane on a bluegrass bender. Throughout the album, Joe Prichard and Kristen Wolverton cop the singing styles of Paul Kantner and Grace Slick, respectively. As the disc progresses, however, Wolverton occasionally allows other influences to shine through her robust vocals — most notably the styles of Stevie Nicks and Natalie Merchant. Meanwhile the band augments their songs with lovely string arrangements (One Day Away from the Cusp), fanciful flights of fiddle (Honeybee), and bubbling grooves (Pinwheel) — all of which merge into a rich stew of bluegrass, pop, and rock. While the songwriting on Geode, done primarily by Prichard and Wolverton, fails to crack the top-tier groups like the Grateful Dead, the David Nelson Band, Blues Traveler, and Widespread Panic, it is still miles ahead of a great majority of the jam band scene. With time, the duo will no doubt refine their craft, and when that happens, The Recipe surely will be a force with which to reckon. In the meantime, the band's lyrics are more than adequate. That is: They actually say something meaningful, thereby magnifying the songs' swirling rhythms and cosmic journeys rather than distracting from them. Geode is available from Barnes & Noble.